Blocking Peptide Zu diesem Produkt passt das Blocking Peptide ABIN985742. 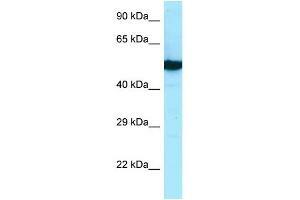 Produktmerkmale This is a rabbit polyclonal antibody against TUBB2B. It was validated on Western Blot. Hintergrund The protein encoded by this gene is a beta isoform of tubulin, which binds GTP and is a major component of microtubules. This gene is highly similar to TUBB2A and TUBB2C. Defects in this gene are a cause of asymmetric polymicrogyria.